Hello, and welcome to the Crystal Shard site. These pages are devoted to game design, both of the paper or board kind and of the computer kind. They also serve as a showcase for the games I've written with some help from friends, at least those games that are actually complete (or at least playable), from some GW-basic expiriments in VGA or even CGA graphics that I made in high school, to two Windows DirectX games with full mouse and soundcard support that actually got published in the recent past. Admittedly both are still in retro-style, but that's because I'm not an artist. However I do vouch for the quality and entertainment factor, and would welcome you to try it out for yourself. Should you have any questions or comments I can be reached here. Featuring heroes, tactical combat, special resources, split-screen and hot-seat multiplayer modes, a random world generator, a map editor and an extensive tutorial. There's this mine, you see. There's lots of gems there, waiting unhappily for their rightful owners to come and dig them up. It goes without saying that those gems would be much happier in your pockets. SubTerra has 450+ challenging levels, some which reward smarts and some which require lightning reflexes. It features a huge variety of tricky traps, creatures, and power-ups, guaranteeing plenty of variety on the way down. Meet the munchkin, evil skull and duplicator! Also featuring demo recording, on-line help and a level editor with a yearly design contest. A Tale of Two Kingdoms is a full-length graphical adventure with a mood of fairy tales, magic, and intrigue, and strives to be one of the best AGS games yet. Meanwhile, danger approaches, in the form of an invading army, a hostile giant, and a mercenary troop who are ancient enemies of the Theylann king. A fan remake of the classic game by Sierra. The storyline has been improved, for instance the villagers now show the fear they feel for the evil wizard. The game ties its story in with the other games in the King's Quest series. A number of scenes have been added, particularly in the part of the game that plays in Daventry. More puzzles have been added, especially to the objects that were just lying on the ground in the original. And finally, there's all-new pretty MIDI music, and a point-and-click interface. Block-O-Mania is best described as 'Soko-Ban for experts.' The object of the game is to push all blocks onto the right storages: red blocks onto red storages, green on green, and blue on blue. Your progress will be hindered by one-arrows, one-time passages that turn into solid walls after you pass through them, and many other devious traps. The game rewards meticulous and thorough planning. This excellent puzzle game will keep fans of challenging brainteasers occupied for hours on end. You can even design your own levels and torture your friends with them. META is one of the most surrealistic adventure games ever, where a bug truly is a feature. Awesmoe Quest (sic) has so many features that it's actually impossible to complete. Can you finish it anyway, with the help of everybody's favorite mascot, Cuppit? 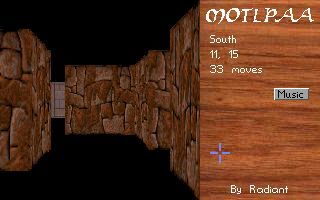 MOTLPAA is a simple maze game that uses first-person 3-D perspective, including random mazes and automapping. And a piano. It was mainly written as a feasibility study in AGS. Radiant FontEdit is a utility to edit font files and convert between AGS, SCI and BMP format. This is my ADVenture And Neat Conversations Engine (yeah, I know it's a crappy acronym). It runs text adventures using an internal scripting language, which uses an intuitive form of 'input:response' and requires no programming experience. It's not as versatile as Z but it'll do. Included are three adventures I wrote, which can be used as samples. Also included is some of the best music possible for the PC-speaker, done by alternating tones so quickly they actually sound like chords. Full source code is included for both. The final link holds five more text adventures, in Dutch. Simplicity - the number of rules and amount of dice rolling is kept to a minimum. This accounts for good flexibility. It should be easy for beginners to grasp the rules and create a character. Character creation is easy even for those who never played a roleplaying game before. Amber is an intriguing rpg by Phage Press, set in the realm of Roger Zelazny's books. The archive contains a timeline and family information, and an alternate ruleset based on simplex that allows for more detailed characters than the original system, which can't do much with Florimel's charm for instance. Paranoia is a hysterical creation by West End; the archive contains several bureaucratic forms, traps and mission ideas. Ultraviolet clearance only, don't say I didn't warn you. D&D should be well-known; the archive contains six prestige classes, several dozen spells, four low-level adventures and some storytelling suggestions. Legal notice: All files available from this page are copyrighted by Pieter Simoons and may not be distributed without express written permission.